I do hope that babblers recognize the brutal denial of the right to national self-determination of the Catalan people. That does not necessarily mean supporting or advocating independence. This is a question of democracy. https://ricochet.media/en/1970/spains-crackdown-will-only-fuel-independe... Toula Drimonis on the brutal Spanish clampdown and the right to self-determination. The Spanish government is to suspend Catalonia’s autonomy and impose direct rule after the region’s president refused to abandon the push for independence that has triggered Spain’s biggest political crisis for 40 years. As a result, it said, article 155 of the Spanish constitution would be invoked to begin the process of suspending the region’s self-rule. “At an emergency meeting on Saturday, the cabinet will approve measures to be put before the senate to protect the general interest of Spaniards, including the citizens of Catalonia, and to restore constitutional order in the autonomous community,” it said. Speaking at the European Union summit in Brussels on Thursday, however, the French president, Emmanuel Macron, said the event would be “marked by a message of unity around member states amid the crises they could face; unity around Spain”. According to article 155, which has never been used, the Spanish government will need to lodge a formal complaint with Puigdemont, then submit its proposals to the senate for debate and approval. As a result, it will be at least a few days before concrete steps are taken. A Spanish government spokesman said this week that article 155 had been designed not to remove Catalonia’s autonomy, but to ensure its autonomous government adhered to the law. Hundreds of thousands of people have taken to the streets of Catalonia to protest against a judge’s decision to detain two prominent pro-independence leaders, as tensions between the Madrid and Barcelona governments continue to rise. On Monday night, Spain’s national court denied bail to Jordi Sánchez, the president of the Catalan National Assembly (ANC), and Jordi Cuixart, the president of Òmnium Cultural. Both men are being investigated for alleged sedition in the run-up to the regional independence referendum two weeks ago. Yes, that was on Tuesday, but people will be getting out of work soon in Catalonia. https://www.worldtimezone.com/time-europe12.php The Spanish State is in the same time zone as France; Portugal in the same as Britain and Ireland. It looks like we are in for a lengthy impasse on independence in Catalonia. But as this political stalemate unfolds, a much more fundamental process of self-determination is well under way. The international community still fails to recognise that the region has witnessed an unprecedented revolution in participative democracy that started long before the referendum, and will almost certainly outlast any constitutional settlement. This is not a struggle for “nation” or flag, it is part of something much more fundamental to the future of both the Catalonian and the Spanish people. Anyone who knows about local politics in Catalonia will know this is not mere sloganising. Perhaps the best-known of the left’s alternative strategies in local government is in the Catalonian capital, where Barcelona en Comú and the mayor Ada Colau have been in power for two years. Across the region the CUP (Popular Unity Candidacy party), Barcelona en Comú’s coalition partner on the left in some councils, controls around 20 municipal councils – representing more than half a million people – and has 10 seats in the Catalonian parliament. The social and solidarity economy has been developed by local movements for at least 20 years, but the economic crisis and the relatively recent political project of municipal socialism have boosted its momentum. One of the most outstanding projects has been Som Energia, a co-op of consumers that uses only energy from sustainable sources. Guiamets, a small town governed by the CUP, has contracted all the energy to this co-op. It is not unusual for architects, psychologists, or lawyers to group together on co-op principles, and waste recyclers, carpenters, wine and olive producers, graphic designers and even local banking and insurance services are no different. The Network of Social Economy (XES) connects more than 150 co-ops and organisations. Support for the “solidarity economy” as an alternative to capitalism is supported by new grassroots political structures. “Constituative, or constituent, assemblies” in the neighbourhoods involve hundreds of people discussing and then mandating the course of action their councillors and MPs take. It is not mere rhetoric when the parliamentary leader of the CUP, Anna Gabriels, says: “We know that to avoid continual economic and social crises, we need to build new economic and social relationships. We are anti-capitalist, socialist and feminist and we want to build a new republic on that basis: one that is sustainable and nurtures solidarity and equality.” And this is the point that the left across Europe hasn’t yet grasped: this aim has always been part of the self-determination movement. The wide range of different political groups in those communities have displayed an incredibly mature approach that is committed to the neighbourhood, rather than the nation, as the focal point for action. It is this commitment that ensured high level of involvement from women’s collectives, migrant solidarity groups, independent trade unions, autonomists, anarchists and the social centres. As the international media sees an oversimplified battle between Catalonian and Spanish nationalisms, the political elites in both states are looking over their shoulder at a movement that threatens to shake the foundations of both. Yes, it is very important to insist on that. It is more a question of "projet de société", not the nationalism that thinks that one's nation is better than others. Though of course there are also rightwing nationalists in Catalonia as elsewhere. I want to point out that there is a concerted army of Spanish-state trolls in the comments. Spain can be held together, perhaps, by repression. But when it comes to legitimacy of that union, denial of self determination destroys the legitimacy of the union. We have been speaking of Canada here as well. We all know that. The acceptance of Quebec as a nation and its right to self determination gives greater legitimacy to Canada's union. A union of peoples is an at-will relationship. Demonstrating that will, with the right to leave proves the legitimacy of the union in a way that repression disproves it and contradicts it. A lack of acceptance of a right to self determination of a people is an occupation. This is true about Spain as well. Spain is losing its legitimacy. I have stated here that I do not like nationalism and I do not like nationalism to trump individual rights, but association is an individual right and groups have rights due to the individual right of association with them (You can read Dr. Bryan Schwartz professor of law at UM on this point). The recognition of group rights as related to individual rights is not a right wing concept. Schwartz is very much to the left. Group rights, according to him, are an expression and extention of individual rights. When you deny a group self determination, you deny all of those who associated with it individual rights that they hold. ..canada's legitimacy is certainly in question as it pertains to indigenous nations. I was just about to say that. It isn't only about Québec - or Acadia. The Indigenous peoples suffered not only national oppression but various forms of cultural and physical genocide. The only comparable crime against (officially) white francophones was Le grand dérangement - the expulsion of the Acadians. Not to mention that Canada has never recognized Québec's right to self-determination, and has in fact officially rejected it in court rulings and legislation. The Union between Quebec and Canada gains legitimacy by the self determination of Quebec and loses it where this is not respected. I don't think there is a question about Canada's legitimacy when it comes to Indigenous peoples. Given the lack of treaties in parts and broken treaties in others and the consitutional claim to equality when the government does not provide equal services -- Canada is not legitimate. I think there is no question there. The recognition of group rights as related to individual rights is not a right wing concept. Schwartz is very much to the left. Group rights, according to him, are an expression and extention of individual rights. When you deny a group self determination, you deny all of those who associated with it individual rights that they hold. ​But what group is being denied self-determination? Polls are clear that Catalonians are split, with some suggesting a small majority wanting to stay within Spain. Are they a group as well? Does it come down to voting neighbourhood by neighbourhood over whether to secede or not? Or block by block? I think legitimacy is more of a continuum than a state. The principle of self determination for Quebec has been accepted by enough Canadians and votes which have been accepted as legitimate. This works in favour of legitimacy. Any denials of that self determination work against legitimacy. I say this purely realted to that relationship. A relationship that is at-will is legitimate in this way and one that is not isn't. Very correct to say that Indigenous people's situation makes Canada not legitimate since that is not an at-will relationship but a colonial one that has had no reconciliation. To me need for the request for nation to nation talks is a recognition of this. Real reconciliation would deliver Canada legitimacy with respect to Indigenous people. as many say the exploitation has to stop before reconciliation can begin. I think many here agree on this. A vote was help and the Spanish government is not questioning the vote so much as the concept of seperation and self determination itself -- they are accusing the leaders of sedition after a democratic vote. This was a legitimate elected government in a recognized territory calling a vote and getting a 90% approval. ..i acknowledge that under colonization the indigenous peoples have felt the effects the most and suffered the worst. having said that i suggest that canada is a colonial state and all those peoples, processes and institutions under it's jurisdiction are also colonized. there is no distinction because the colonizer is the same. ..lesson we can learn from catalan is from the participatory democracy being built to replace capitalism/colonization. ​The Spanish Supreme Court held the vote to be illegal, and less than half the eligible electorate actually voted. You can hardly characterize that as a majority. In fact polls have shown the population to be split, with a slight majority wanting to stay within Spain. ​My question is, who draws the borders? If the majority in one town wish to remain in Spain will they be allowed to vote, and secede from Catalonia upon winning that vote? Could individual neighbourhoods have their own vote, and secede or not? There would also be any number of people living in Catalan who are not Catalonian. Would they have to get a Spanish passport, show proof of loyalty to Catalonia, be given automatic citizenship in the new state of Catalonia? The devil, as is often the case, is in the details. Looks like the people of Catalunya actually have leadership with some guts, and a responsibility to actually represent the will of the people and consult...maybe this will start a trend! Therefore, the Green Party of the United States fully supports the present call by the acting Catalan parliamentary leadership for a direct, two month long, unconditional dialogue with the central government in Madrid to try to reach a negotiated agreement in response to the present impasse in the political, and legal status of Catalonia in relation to the Spanish state and its peoples, as presently constituted. The Green Party of the Unites States also vehemently opposes the Spanish central government's decision to implement Article 155 of the constitution in response to the present impasse in Catalonia. This action, if carried out, would de facto "illegalize" the presently elected Catalan autonomous government and place all of its critical authorities under the Spanish central government's authority. We strongly believe this will only serve to exacerbate the present tensions and risk a very dangerous escalation of an already delicate situation that could further fracture and galvanize not only Catalan society, but Spanish society as a whole. We furthermore call for the support of the popular call across Catalonia for the Spanish authorities to immediately release political prisoners, Jordi Sánchez and Jordi Cuixart, and for the Spanish attorney general's office to withdraw all charges of sedition against all acting Catalan government officials for their nonviolent actions in defense of the right of Catalans to peacefully cast a vote during the October 1 referendum. The newly-launched Catalan Defence Committee Scotland follows the establishment of sister groups across Europe and has already won support from several prominent politicians and campaigners, including lawyer Aamer Anwar and Scottish Greens co-campaigner Maggie Chapman. We are definitely living in exceptional times. As a union, we have never had to face such a serious and dangerous political situation. Out of responsibility to the education community, we have to be where needed: with the people, the Catalan institutions and the education community iself. First of all, we demand the release of political prisoners. Jordi Sánchez and Jordi Cuixart have been detained for their ideas and because they represent millions of Catalans. Feeble legal pretexts are worth nothing here. As long as they are in jail, we live with evidence of intolerable dictatorship. Secondly, the activation of article155, based on a biased and self-interested interpretation of the legislation itself, amounts to an unacceptable suspension of Catalan institutions and representatives democratically chosen by the people of Catalonia. Article 155 is the legal excuse to implement a dictatorship that was already in place from the moment that, during the October 1 referendum campaign, websites were closed, public employees arbitrarily detained, private correspondence violated and an endless list of violations of human rights and individual liberties took place. Therefore, we in USTEC-STEs are and will be where we have to be right now: alongside Catalan institutions and Catalan democracy in their struggle to survive. Finally, and based on the evidence of the attacks of the PP and C's and of some former PSOE leaders--along with their dope-pushers in the media--there may be a risk of intervention in the Catalan school system. If that happens, USTEC-STEs will not recognise as valid interlocutors those who do not represent the expression of the people's will: we also call on the educational community to resist the demands of a state that, based on the lessons of reality, can no longer be considered democratic. The first mobilisation, called by the Education Community United Framework (MUCE) will be on Wednesday October 25 at 1800 hours, in front of the town halls of the shire capitals. Our desire is that it be to open to all society and all organisations. Catalunya en Comú proposes the creation of a broad pro-sovereignty front to "work out defensive action to counter the blow of article 155 and, on the other hand, to work out offensive action based on rethinking the [pro-independence] road map, which would have to be a constituent process about model of country." According to another Catalunya en Comú source "as broad a democratic front as possible is needed, which doesn't mean we're defending an electoral front." School principals and teachers launch network to organise disobedience to intervention, based on recognition of Catalan education department as only legitimate authority. [TWEET] We resisted 40 years of dictatorship. We shall also know how to resist the intervention into our schools and our government. Teachers, forward! Maria del Mar Bonet - "Què volen aquesta gent" What do these people want? Romeva was asked whether he believed all institutions, including the police, would follow orders from Catalan institutions rather than obey the Spanish government. The crisis over the wealthy Catalan region has raised fears among European countries of a spillover to other parts of the continent. “We will not recognize as valid interlocutors those people who are not representatives of popular legitimacy,” the teachers’ union USTEC said in a statement. Several influential Catalan newspapers called on Puidgemont on Sunday to resolve the crisis by calling a snap election before direct rule becomes effective. However, an opinion poll published by the El Periodico newspaper on Sunday showed a snap election would probably have results similar to the last ballot, in 2015, when a coalition of pro-independence parties formed a minority government. 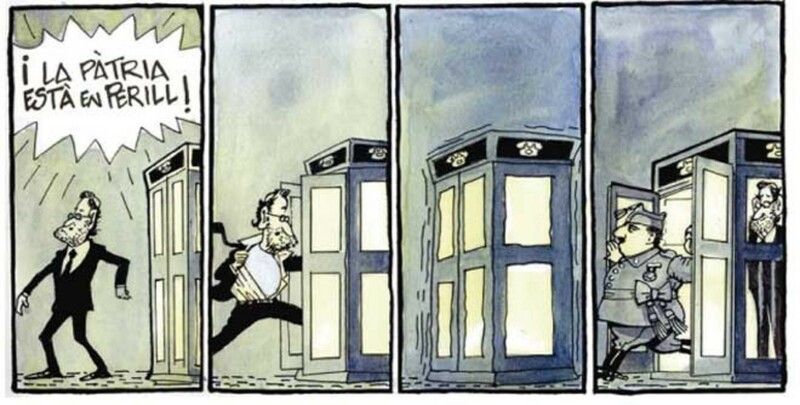 I was so hopeful for Greece so now I am afraid to feel that way for Catalonia. The forces against them are powerful. It seems to me that a snap election would be a good idea as it would illustrate that Catlonians have not changed their mind. Catalonia, Lombardy, Scotland … why the fight for self-determination now? Woodrow Wilson used it to dismember the empires of old Europe; Vladimir Lenin promoted it with the aim of destroying imperialism; the UN wrote it into article 1 of its founding treaty. The right of peoples to self-determination has been a principle in international law since Versailles and confirmed as the basis for negotiations on issues as varied as Kashmir in 1948, Vietnam in 1973 and the state borders of eastern Europe in 1990. But from Kirkuk to Barcelona, the national question has resurfaced to flummox modern democracies and confound the political tradition of technocratic centrism. As the Spanish Socialist party prepares to endorse the takeover of Catalonia by a rightwing government in Madrid, as an Italian president of the European parliament issues panicked warnings to autonomists in the northern regions of Lombardy and Veneto, those in power are having to reach for the textbooks on international law. The issue of national self-determination is back and unitary states are struggling to cope with it. The left, particularly, seems psychologically unprepared for the eruption of struggles for democracy and social justice where nation and ethnicity, not class, is the driver. And the EU is trapped in a legal limbo. Its own founding treaty failed to include the right to self-determination of peoples – preferring instead to give that right only to nations already recognised as states, in the form of article 50. To move forward we need to understand: why are regions, states and peoples beginning to re-pose the question of national self-determination now? For Spain and Italy it is clear: the mixture of austerity, corruption and political sclerosis at the centre has limited the reality of regional democracy. It has pushed autonomous regions such as Catalonia towards independence and places such as Lombardy and Veneto towards seeking fiscal autonomy from an essentially dysfunctional central state. As calls for autonomy and independence proliferate, mainstream left parties are failing to understand the basic principle: in some circumstances, the national question is not a distraction from the fight for social justice – it is the frontline of it. And it is not going away. Above the problems of economic failure and racial polarisation, the positive factor driving progressive nationalisms, from Scotland to Catalonia, is technological change. Information-rich societies reward the development of human capital; so the ability to study in your first language, to participate in a rich national culture, to create unique local selling points for incoming foreign investment is more important than ever. If the regions, peoples and nations currently demanding more freedom seem to be driven by “cultural nationalism”, that in turn is driven by technological change plus global competition. The second impact of these forces is the emergence of successful big cities and devastated small towns. In large cities with dense networks of information and culture, you can survive globalisation. In small towns it is harder. So the logical economic strategy is to create a “region” or small nation focused on one big city, and develop the suburban and rural economy in synergy with that city, not the bigger unitary state. If Barcelona were not a massive global success story, the impetus behind Catalan nationalism would be smaller. One Dublin-based financial intermediary told me that Irish businesses continually struggle to make the idea of “Ireland” salient for big Chinese investors: that is despite Guinness, James Connolly and James Joyce. How much harder must it be to project Lombardy or Veneto as a global destination for inward investment, when you’re up against a corrupt and semi-functional Italian state? Understanding claims for secession and autonomy does not mean acceding to them: authoritative legal referendums are the method enshrined in international law to test such claims – and it is a disgrace that the EU and Spanish state have refused one in Catalonia. It is a clever tactic but unfortunately it is not one available to them. The Spanish government has taken power such that they have no authority to call an election or anything else. They held a referendum and the Spanish government did not use its authority then, to remove the Catalan government at that time, to prevent it. They said it was illegal but it is a difficult argument to make that a regional government cannot, being duly elected, put a referendum to its people. They could say that it would have no effect, but the Catalan government has not moved quickly and instead asked to talk. There also the issue of what constitutes a mandate. They won a 90% vote but the argument used is to presume any who did not vote as counted against -- no matter the reason. If there were a Catalan election and only, say 60% voted then others would want to speak for those who did not express a ballot. There are some options available. I think the best one is to do the following -- say that the Spanish government protested the vote and now argues that some of the votes were a boycott. Let the Spanish government endorse a referendum on a clear question agreed to by both sides and take the result of that. Each person knowing the vote is endorsed by both sides can take responsibility to vote, or not. Voters would be listened to. Alternately, the Catalan government could offer a negotiation with a final vote going back to the people with a specific proposal following a fair negotiation in keeping with reasonable international legal and accounting principles. But the issue here is that Spain's position is that the country is not divisible and that no vote means anything as the people of Catalonia do not in fact have the right to self determination as a region. Until the question of self-determination itself is settled, no discussion about any voting has any purpose or possibility of success. Spain has not at any point agreed to accept this self-determination. The vote was held in protest illegally under the government of Spain because this right is still not accepted in Spanish law. All other discussion is irrelevant without addressing this. Here is the second difficult issue for Catalonia. Without the endorsement of the Spanish government of the referendum observers may conclude that the vote is a protest as voters may not believe it would result in independence. In other words the vote, held without sanction, can only ever be a protest. This completes the circle back to the right to self determination that must be recognized and all the rest is merely efforts to secure or deny that fact. This question must be settled before any other issue can be addressed. ​It was in fact the Spanish Supreme Court who said the referendum was illegal according to the constitution. Indeed. Spain has a constitution that does not grant self-determination. Everything we see here is a struggle with respect to that issue. I pointed out that voters in the referendum were aware that self determination is not recognized and so their vote is trying to establish self determination. This is why I said that you cannot, in the context of knowing that self determination is not recognized, assume that Yes voters truly intend independence from that vote. This is a solid vote to raise the issue of self determination. The response by the national government is to accuse them of sedition. I think in this case, it is important to recognize that this is where the battle is. It cannot be read on the issue of independence directly for the reasons I stated above. 2) Deny self determination and send the message that the only way to advance independence will be through violence. By taking the democratic option to find self determination off the table Spain is daring independence movements to fight them (or not) using other means. I do not think this is healthy. It could work if the independence movement is weak, but if it is strong it could only strengthen it and/or lead to bloodshed. I think the proper forum for Independence is by vote and a national government rejecting that option means it is prepared to use force rather than the ballot box to settle the matter. What could happen to Spain if they lose the gamble is that they could face violence followed by a process they woudl have even less control over than they do now. In the current context if Spain were willing to agree to self determination, they woul have more influence over what that would look like at the ballot box. If they reject that they will lose some of that influence. In other words, Spain might be able to now offer self-determination in exchange for a form of clarity Act to set terms. Without any option for Self Determiantion, Spain loses the ability to set the rules. This could backfire such that the rules in the end become worse than what might find widespread acceptance now. They are gambling and it is unclear what the result may be. Any violent suppression will devastate their economy and might lead to losing their status in Europe. I think this is a bad strategy for Spain. "The fatherland is in danger!" ​Thus the Spanish government could not sanction the referendum without contravening the constitution themselves. So the correct path is to work to change the constitution. As to other beliefs that an independent Catalonia is a threat to the EU, that may be so. What it is not, is a threat to capitalism. Capitalism existed before the EU existed. Capitalism existed when Germany was a loose collection of city states. Capitalism has existed through two devestating wars, and numerous crashes and depressions. Capitalism has existed through the collapse of the British Empire and the rise the American empire. Anyone who thinks capitalism will come to an end because of the independence of Catalonia is dreaming in technicolor. Even more so, anyone who thinks capitalism can be defeated by Balkanizing nations states has no understanding of capitalism. That sort of independence does nothing more than create the groundwork for future disputes between independently self-determined regions. And we should all know where that leads. Yesterday's mass meeting of Catalan TV3 workers to organise resistance to any State intervention into Catalan public broadcasting. 6) Rejects the appointment by the Spanish Government, bypassing all democratic and legal procedures, of new public media executives. If this happens we will have no choice but to not recognise their authority. What the Spanish government could have done is accept the Catan government's offer to talk and understand their retraint was constructive. The response from the Spanish government is not constructive. My question is, who draws the borders? If the majority in one town wish to remain in Spain will they be allowed to vote, and secede from Catalonia upon winning that vote? Could individual neighbourhoods have their own vote, and secede or not? There are no hard and fast rules but yes, if a town wants to become a country I suppose they have that right it just wouldn't make any sense because they would have to set up border controls. If geographically it was a town close to the Spanish border they might be able to make a case for joining Spain rather than Calatonia. It's a combination of critical population mass, economic viability, and strength of desire. All that would be discovered during the movement for separation. ​If this is indeed the case, one wonders then how capitalism got it's start, because the conditions you describe are precisely the conditions in which capitalism began. I pointed out that capitalism in Germany started when it was a loose collection of city states, with very little in the way of a central government. The only way forward for people is to operate the same way as capital does, that is, look at the world as a whole. Breaking up nations is not 'forward', it's backwards. 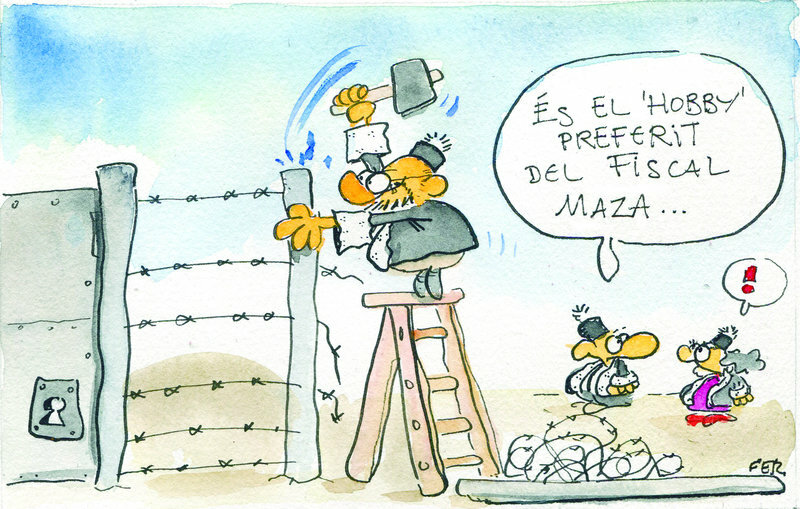 "It's [chief Spanish state] prosecutor's Maza's favourite hobby." There are two days left before the Spanish Senate is expected to approve the suspension of Catalan self-governance and negotiations between the pro-independence groups are gathering speed. Early this morning there was a meeting at the Catalan government palace with pro-independence political parties and associations ANC (Catalan National Assembly) and Òmnium Cultural which saw a first agreement for the proclamation of the Catalan Republic. Nonetheless, sources present at the discussion have emphasised to El Nacional that this first agreement can still change in the coming hours. The announced application of article 155 of the Spanish Constitution to intervene in Catalan institutions puts Mossos d'Esquadra (the Catalan police) between a rock and a hard place. It has escaped nobody's notice that, once the Spanish state's measures are officially confirmed, the head of the Mossos, Josep Lluís Trapero, will be dismissed and substituted for someone nominated by the state. It's predicted that 155 will lead to the shuffling of some commanders. The most optimistic voices are hoping for a "surgical application" of the article, but have no doubt that Trapero and the core of the General Management will be dismantled. It's ever more probable that Trapero will end up in preventive custody if the public prosecutor moves ahead with the expansion of the lawsuit for the Mossos' inaction during the 1st October referendum. And it's ever less probable that general disobedience by the force will be seen because, as sources within the Mossos say, "disobedience is legitimate but it's not an option for police forces". The union of Mossos' commanders, SICME (Union of the Commanders of the Body of Mossos d'Esquadra), is meeting to decide on an official position towards the situation. Their spokesperson, Francesc Carabassa, is waiting for the meeting before commenting, but admits that they "are worried". All the unions agree that there is no other option than to obey. "We have no kind of room for manoeuvre", said the spokesperson for the majority union SAP-UGT (Autonomous Community's Union of Police), Valentín Anadón. Toni Castejón, of Sindicat Mossos d'Esquadra (Union of Mossos d'Esquadra), agrees: "The legal framework obliges [us to obey]. There's no margin for disobedience." "Disobeying has consequences", he remarks, giving all the investigations opened after the 1st October as an example. "Everyone knows that their job and salary is at stake." "We have to obey orders within the law," says David José of Sindicat de Policies de Catalunya (Union of Police of Catalonia). "If the orders don't fit within the law, you have the obligation to not follow them," he adds. "If there's a job that's regulated in every aspect, it's the police," says José. He goes on to repeat that you can't follow orders against the law: "When you're working, this is the only reality that there is". Catalan president Carles Puigdemont has decided, in the end, to not go to the meeting of the commission of the Spanish Senate tomorrow, Thursday, which will analyse the application of article 155 of the Spanish Constitution. Nor will he attend the full Senate meeting on Friday. Sources from the Catalan executive attribute the decision to the fact that the "Spanish government has already decided to apply [article] 155". The Senate's president, Pio García Escudero, had invited Puigdemont to appear in front of either Thursday's commission or Friday's full meeting. Friday's meeting will include the vote needed to approve the enacting of article 155 which would see the intervention of the central government in Catalan autonomy.